I picked a photo from a magazine and described what the model was wearing (all in French of course... go me) and Professeur would draw it. Then it was my turn to listen to the French descriptions of her photo and translate it onto a page through art. 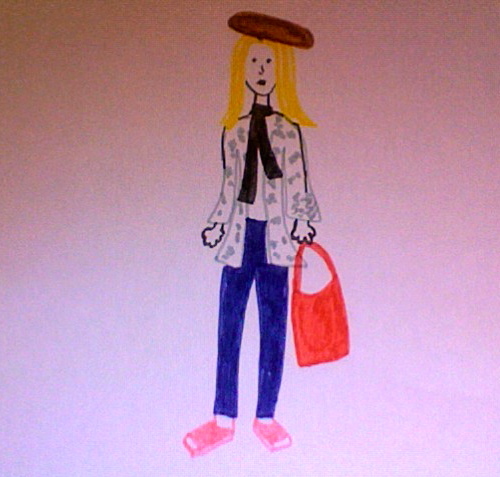 Clearly I should be pursuing a career in fashion. I mean really, look at that thing! Have you ever seen a more sophistically drawn piece of fashion design?! And It's perfect timing since I hear Christian Dior is looking for a new Creative Director. That is cute! You should keep that. I think your artist rendition looks better than whoever that is in the photo. My French lessons stalled at passe compose - I feel your pain. Had to tell you that my scramble word thingamabob that I have to copy to post my comment just now was: "clown"
Ugh. Pass compose. That's when French class started giving me knots in my stomach. Wonderful work!! You should totally apply for the job! Go, girl. Just a few weeks and we can study French together!! I once learned it in school but I forgot nearly everything - malheureusement. And next semester I need to take some extra courses so I thought about choosing French. Dior, j'adore... Sara, j'adaaaare!!! Auf Wiedersehen, John! Guten Tag Sara!! Will you make a Jaffa cake hate for me? No hateful Jaffa cakes please! Which one is the photograph? Artistic talents aside...it looks like you understood everything. Way to go, Sara! Je crois que elle a expliqué tout dans la forme présente! Tu es marrante! Perhaps you can inspire school kids the importance of learning a foreign language while they are in school... much easier than learning..... later! Ahhh passe compose! Trying to figure out whether to use that or imparfait is something that ruins me even after four years of French. Definitely impressed by how well you described the outfit, though -- I would've spent ten minutes trying to figure out the word for "fur," haha. Oh that's fantastic! What and excellent professor you have! I do not know about your professor, but you are good! Until your last line, I was going to comment that you should try for the recently open position at Dior. And then you ruined my joke. omg "passe compose" is taking me back to high school french class. also- i never knew what fearne cotton looked like! C'est bon!....I'm struggling here to remember my manditory highschool french (it's a Canadian thing). Um...bien fait! Je suis impressionne! omg, i am loving your blog! your shotgun wedding story just cracked me up! all i see is some mad french skills! get it, lady! I am seriously impressed with your drawing! It's so difficult to show clothing on my stick figures. Draw on! BTW: Did you know Tim Gunn has a new book out, its wonderful! Aaaaaaahahaha! That is so cute! You made me snort . . . I was laughing that hard. Perfect!! You can do art and fashion:). Btw! I love the blog shares on twitter. Also tried to send you a tweet message, but I can't bec Realized you were not following me:(. I believe you've found your calling.